Home Juventus Napoli Football Photos : Juventus beat Napoli in dramatic match. Football Photos : Juventus beat Napoli in dramatic match. Serie A leaders Juventus held on to win 2-1 at Napoli in a stormy top-of-the-table clash on Sunday which saw both teams have a player sent off and Lorenzo Insigne miss a late penalty for the hosts. The win, courtesy of goals from Miralem Pjanic and Emre Can, took Juve 16 points clear of Napoli and almost certainly wrapped up an eighth straight title for the unbeaten Turin giants who have 72 points out of a possible 78 with 12 games left. 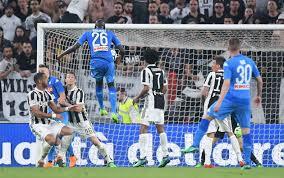 Juventus raced into a 2-0 halftime lead after Napoli goalkeeper Alex Meret was sent off in the 25th minute. The visitors then had Pjanic dismissed and Napoli's Jose Callejon pulled one back before Insigne let the Turin side off the hook. The game hinged on an incident in the 25th minute when Napoli fullback Kevin Malcuit's back pass was intercepted by Cristiano Ronaldo, forcing Meret to come out of his penalty area and lunge at the Portuguese forward who went to ground. The referee awarded a straight red card without reviewing the incident on the pitchside monitor. Replays, though, suggested that, although Ronaldo had to jump over Meret's outstretched leg, no contact was made. The rules, as I understand them, say that Meret should be sent off whether he makes contact or not," said Juve coach Massimiliano Allegri. The referee decided, as did the video assistant. However, Napoli coach Carlo Ancelotti said the referee should have seen the replay himself. The game was influenced by a controversial decision - did Meret touch him or not, which direction was the ball going? It would have been easier if the referee had looked on the monitor, given that it is there," he said.